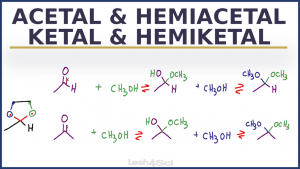 This video offers an overview and comparison between the acetal, ketal, hemiacetal, and hemiketal reactions including stability of products and intermediates. You’ll also learn my shortcut trick for quickly identifying carbonyl and alcohol reactants from products and acetal or ketal products from reactants. This is Video 1 in the Acetal Series. Click HERE for the entire series. Thank you so much for all that you do. I received your email about the MCAT Amino Acid series. But what I’ve always had trouble with was carbohydrate chemistry. In fact, I find it more challenging that protein chemistry. I watched your Acetal videos, but fail to see the cyclization and reactions that form the sugar moieties. I also can’t tell which atom is which (ie anomeric carbons and reducing sugar, etc). Please HELP!